In this educational quiz article we are going to share some most important multiple choice questions of Indian Ancient History i.e. 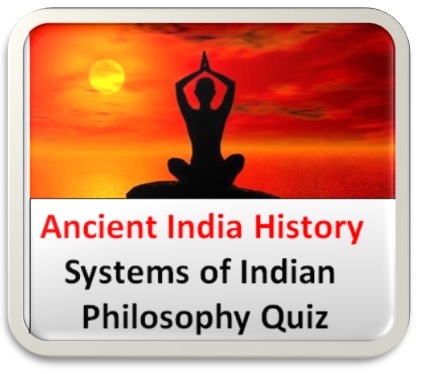 Ancient India Systems of Indian Philosophy mcq. With the help of these quiz competitive exam aspirants can solve various questions belongs to ancient history subjects. 1. Which of the following School is known as Lokayata a term means Naturalist(Sanskrit) or Worldly (Pali)? II. Yoga gives the practical steps to realize the purusha distinct from prakriti. III. Yoga system was founded by Hiranygarbha and later systematized and propagated by the sage Patanjali. 3. Which of the following School challenges the authority of the Vedas as well as the hegemony the Brahman priests? 4. Who among the following founded Ajivika Sects in the 5th Century BCE? 5. Which of the following School accepted perception and inference as sources of valid knowledge? 6. Which of the following is/are correct key principles of ‘Doctrine of Materialism’? I. All things are made of earth, air, fire and water. II. That which cannot be perceived does not exist; to exist implies to be perceivable. III. Heaven and hell are nothing but inventions. The only goal of humans is to enjoy pleasures and avoid pain. IV. Providing a good living for the priests is a sufficient explanation for the practice of religion. 7. Which of the following was the doctrine of Ajivika School? I. Its methodology is based on a system of logic that has subsequently been adopted by the majority of the Indian schools, in much the same way as Aristotelian logic has influenced Western philosophy. II. The goal is to quiet one’s mind and achieve kaivalya (solitariness or detachment). 9. Which School is originally called Sanatana Dharma? 10. Which of the following statement(s) is/are correct explanation of the the term "Jiva"? A) It is that state in which puruṣa is bonded to prakṛti in some form. B) To realize the purusha distinct from prakriti. C) It is immutable, eternal and conscious by its very nature. I. VishishtAdvaita (“Advaita with uniqueness; qualifications”) is a non-dualistic school of Vedanta philosophy. II. Ramanuja, the main proponent of Vishishtadvaita philosophy contends that the PrasthanaTraya (“The three courses”), namely the Upanishads, the Bhagavad Gita, and the Brahma Sutras are to be interpreted in a way that shows this unity in diversity. 12. Which of the following systems of Indian Philosophy uphold the ideology of Charvakism, Ajivika, Jainism and Buddhism? 13. Who among the following written Nyaya School is based on the Nyaya Sutras? I. The Vedanta, or Uttara Mimamsa, school concentrates on the philosophical teachings of the Upanishads (mystic or spiritual contemplations within the Vedas), rather than the Brahmanas (instructions for ritual and sacrifice). II. The Vedanta focus on meditation, self-discipline and spiritual connectivity, more than traditional ritualism. 15. Which of the following systems of Indian Philosophy uphold the ideology of Vaisheshika, Nyaya, Samkhya, Yoga, Purva-Mimamsa, and Uttar-Mimamsa? II. The main objective of the PurvaMimamsa School is to interpret and establish the authority of the Vedas. 17. Consider the following statement (s) is/are related to the Characteristics of Indian Philosophy I. All the schools emphasize that the philosophy must have a positive impact on life of man. The schools have a general agreement on the importance of the Purushartha. II. All the schools agree that the philosophy should help man in realizing the main ends of human life: the purusharthas, i.e. artha, kama, dharma and moksha. 19. Which of the following statement (s) is/are correct about Indian System of Philosophy? A) The Indian philosophical systems are classified according as they accept the authority of the Vedas or not. 20. Who was the founder of Sankhya system of Indian philosophy?